Phyllis (Facella) Russo, of Lawrence, passed away at Lawrence General Hospital on Thursday, October 18, 2018 with her loving family at her side. The beloved wife of the late Armand Russo, she was 98 years of age. Born, raised and educated in Lawrence, Phyllis was born to the late Nick and Mary (Desantis) Facella. After finishing Lawrence public schools, Phyllis met the love of her life, Armand, whom she met at a dance. They married, made their home in Lawrence, and brought their daughter, Gerry, into the world. In addition to being a full-time parent, Phyllis had a proud forty-three-year career as a box maker for Frank C. Myers Company. Her husband Armand passed away on October 14, 1986. Phyllis was an avid dancer and loved to go to dances with Armand whenever she could. She was a big fan of the holidays and loved to decorate her entire house every year. She loved vacationing, especially to Salisbury Beach, which she and the family had made a tradition for thirty years. Her jigsaw and word puzzles while watching her favorite shows were one of her favorite hobbies of all. Her love for the color red will always be remembered by those who knew her best. A proud giver to her family, Phyllis will be remembered for being an incredibly hard worker all of her life. 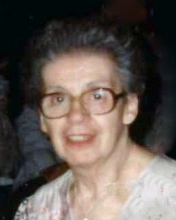 Sadly, in addition to her parents and her husband, Phyllis was predeceased by her siblings, Ann Gagnetto, Phyllis Santopierto, and Alberta Frascati; and grandson, Gerald Gallagher. Phyllis is lovingly survived by her daughter, Geraldine (Russo) Gallagher and her husband, Edward of South Lawrence; brother, Santos Facella of Orlando, FL; grandchildren, James Gallagher and Christine Gallagher; and great-grandchildren, Cameron and Cheyenne. Relatives and friends are respectfully invited to attend visiting hours on Monday, October 22, 2018 from 4:00 – 8:00 PM at Cataudella Funeral Home, 126 Pleasant Valley St., Methuen. A funeral mass will be held in Corpus Christi Parish at Holy Rosary Church, 35 Essex St., Lawrence on Tuesday, October 23, 2018 at 10:00 AM. Interment will follow at Elmwood Cemetery, Methuen.